I had heard about this book, so when I saw the audio version at the library, I picked it up. Stats: Audio is 9 discs – 11 hours. Narrated by Feodor Chin. The print book is 290 pages, published in 2009. Blurb: In 1986, Henry Lee joins a crowd outside the Panama Hotel, once the gateway to Seattle’s Japantown. It has been boarded up for decades, but now the new owner has discovered the belongings of Japanese families who were sent to internment camps during World War II. 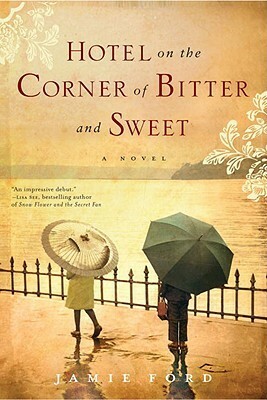 As the owner displays and unfurls a Japanese parasol, Henry, a Chinese American, remembers a young Japanese American girl from his childhood in the 1940s—Keiko Okabe, with whom he forged a bond of friendship and innocent love that transcended the prejudices of their Old World ancestors. After Keiko and her family were evacuated to the internment camps, she and Henry could only hope that their promise to each other would be kept. Now, forty years later, Henry explores the hotel’s basement for the Okabe family’s belongings and for a long-lost object whose value he cannot even begin to measure. His search will take him on a journey to revisit the sacrifices he has made for family, for love, for country. What I liked: The story does a good job of illustrating a sad time in US history, making it more personal. It takes place in Seattle, but must have occurred all along the West Coast. The number of people affected must have been huge. Hard to imagine what happened to the lives of these families. Mr. Chin does a very good job with the narration. What I didn’t like: Not much. It was well written and using children to portray some of the issues involved made sense, but I guess because I had read other similar books about internment camps, I was a bit bored. It wasn’t because of the story, that is just me. It also was a bit predictable, but not so much that it ruined the story. One thing I thought was a bit unbelievable was that Henry waits over 2 years for Keiko, then just as she’s getting out of the camp, he takes off for China, per his Father’s wish. Why couldn’t he wait a month or so and go after he exhausted all efforts to find her. Just seems a bit unreal after waiting for so long. This entry was posted in Books, Review and tagged feodor chin, jamie ford, Japanese interment camps, WWII.